02. Peaches feat. Rodney P.
08. You'll Never Find feat. Rodney P.
10. Something To Trust feat. Rodney P.
Barry Ashworth and Jason O'Bryan AKA the Dub Pistols have spent the best part of a decade at the forefront of Beats culture. From their early singles for Concrete Records to their genre defying 'Six Million Ways To Live' long player, the Dub Pistols have always added a much needed Rock n Roll swagger to the UK's dance scene. Chewing up hip-hop, dub, techno, ska and punk and spitting them out in a renegade futuristic skank they have consistently defied categorisation and exceeded the highest of expectations. Their genre-mashing abilities have led to remix work for the likes of Moby, Crystal Method, Limp Bizkit, Bono, Korn & Ian Brown, and has seen them work with hip-hop legend Busta Rhymes on 'One', a track for the Blade 2 soundtrack and 'Molotov' on the Y Tu Mama Tambien soundtrack. In recent years the band has mutated from a studio based duo into a fully fledged live act, including the talents of UK Hip Hop don Rodney P, the maverick and mercurial former Specials front man Terry Hall, US rap wünderkind T.K., Sugardaddy horn-blower Tim Hutton and scratch maestro DJ Stix. Their third album 'Speakers And Tweeters', released on 9th April 2007, through Rob da Bank's Sunday Best label, is a consummate statement of intent. Their most accessible to date, the album's 13 tracks draw on a rich tapestry of influences, weaving tight beats and even tighter rhymes into a refined and assured set. The stirring chords and laid-back beats of 'Speed of Light', featuring Blade's skilful flow, opens the album in style. An inspired cover of Punk legends The Stranglers' classic 'Peaches', immediately grabs the attention, with the vocal dexterities of Rodney P and Terry Hall taking centre stage, before the pumping, angular funk of the album's title track 'Speakers And Tweeters' takes hold. A deeply ingrained skank runs throughout the album, as ably demonstrated on the horn-driven 'Running From The Thoughts'. The album's lead single, released on 12th March, sees the Dub Pistols taking Blondie's 'Rapture' and booting it firmly into the future, with Terry Hall's laconic delivery adding an insouciant edge. Following hard on its heels is the bumping krunk of 'Cruise Control', harking back to the classic era of street beats and Electro. The Disco strut of 'Open' and the Black Ark stylings of 'You'll Never Find' keep things on the boil before the Dub Pistols drop a bold cover. A superlative version of The Specials' seminal 'Gangsters' sees Terry Hall, a quarter of a century wiser, reprising his vocal role, giving the 2-Tone classic a knowing air, underpinned by the band's groove juggernaut. 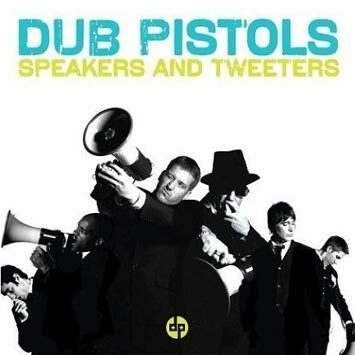 Channelling the spirit of Dr Dre on the anthemic 'Something To Trust', the Dub Pistols approach the last few tracks in full on intergalactic hip-hop mode. 'Mach 10's rolling beats are given an authentic treatment with T.K. 's super slick delivery taking things to the next level. 'Stronger's Roots Reggae lilt and the reflective 'Gave You Time' provide a polished denouement to what is undoubtedly the Dub Pistols' finest hour.